How can I sum up this book - the final in a series that I've followed since I was a teenager? Single words come to mind. Disappointing? Only because this is the final chapter. Unsatisfying? Only because there is so much left unresolved. Bittersweet? Yes, that seems the most fitting word of all, for there is much to admire and much to be annoyed about in this final volume of The Riftwar Cycle. There's little I can say about this book to one who isn't already familiar with the world of Midkemia. Those who aren't, I would advice tracking down a copy of Magician: Apprentice and starting from the beginning. Or, if you're more the gaming sort than a reader, download the Betrayal at Krondor RPG based on Feist's novels. This game served as my introduction to Feist's world and a darn good one it is too! For those of you who are familiar with Midkemia and the series, I will say this. The title is a spoiler and it promises exactly what you'd think. We get to see many of the series' most popular characters again in some form or fashion and most of those we don't see get name-dropped at some point. Many mysteries regarding the cosmology of Feist's universe are explained in a satisfactory manner and even what does not get explained can be written off as being the result of our characters' understanding being limited. In that respect, the series ends The Riftwar Cycle quite well. The points upon which the saga does not end well are the personal storylines of some of the characters - minor in the most recent round of books but major foci in the previous series. So if you were hoping a certain warlock and his demon-smiting ex might reconcile and get back together? Sorry. They're both barely in this one and only in a few battle scenes. Anyone hoping for a grand reconciliation of all the various elven clans? It doesn't happen, though there is some suggestion that things will be different between them in the future. And even as tribute is paid to certain characters, some go unmentioned. Surprisingly, Pug fails to name his first son William and adopted daughter Gamina as he talks about all those he misses dearly in one speech. And while references are made to many of Feist's earlier works, there's little said about others. I was particularly grieved to see no mention of the characters from The King's Buccaneer - still my favorite of Feist's books to this day! Still, that is fitting in a way. For one theme of this book is that life goes on, with or without you. And while many of our favorite heroes are dead and unable to act as our lens into the world of Midkemia anymore, we do know that the story will go on, though we may never hear it. 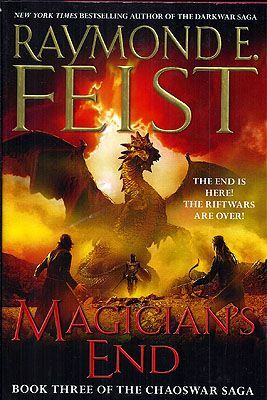 Either way, reading this book made me wish to reread all the Raymond Feist books I've ever enjoyed again. And perhaps that is accomplishment enough for this book.